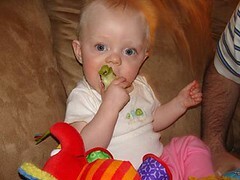 When Daisy was in the NICU, about a month before she came home she was seen by a Pediatric Opthamologist who specializes in the conditions that can affect a premature babies eyes. Two things they look for are the eyes crossing or early on-set near sightedness. In August Daisy had neither of these, in fact the doctor was wowed by her baby blues and said they were mature and just to follow up in the coming year. We have truly been blessed on this journey, she is doing so well. Thank you for all your warm thoughts and wishes for our little girl. Hello! I just wanted to post some pictures taken of Daisy yesterday. I suppose like all flowers she blooms beautifully outside. This past weekend Papa and Nana Janney came out to California for a visit. They arrived on Thursday evening, right in the middle of Daisy's dinner of sweet potatoes and mango. Daisy warmed right up to them both and seemed very excited that they were here. Friday, Paul and Rod went to dinner with a friend in Berkley while Connie and I took Miss Daisy to downtown Pleasanton for lunch. Daisy very politely ate squash in her stroller while we wolfed down yummy Mexican food. Then us girls went walking and shopping - it was a great day! Saturday, Nana and Papa insisted that Paul and I get away for a bit, so we went to San Jose for lunch at Kirk's Steakburgers (which was awesome) and then we ventured to the Winchester Mystery House. Although the house was a bit strange neither Paul nor I felt like it was scary, perhaps because we own a house that is just about as old as the mansion. Sure, it had oddities, but most "Painted Ladies" are a bit odd, that's what makes them priceless. Sunday, Daisy's Great Aunt Lynn and Uncle Randy came for lunch, they brought her some beautiful outfits for the summer. It was so much fun to watch Daisy "mingle" and get to know a small portion of her family. Daisy also got to try Sherbet for the very first time. I'm not sure she was too crazy about it, but it was great fun watching Paul give her a taste. Last night we hung out together as a family, ate Chinese food and watched the Mets beat the Yankees. Nana and Papa left this morning and we miss them already. It was so nice having family here in California, Daisy seemed to really love it. I know I sure did! First off, thank you Sam for keeping the updates and new posts coming on Janney Family over the last few weeks. Also, thank you to everyone that has responded to the posts about Daisy and our northern California exploits. It's made our transition out here that much easier and allowed us to keep in touch with friends from coast-to-coast. For awhile now, since about the time this site turned a year old, I've been wanting to share some insight into JanneyFamily.com and the type of information we know about our visitors - muwhahahaha. Really, it's not as evil as it sounds, and for a site like this, it's more of a general curiousity. So, without further delay on to the stats, which, unless specified, are from Jan. 1 through today courtesy of Google Analytics. 1. According to Alexa, our site ranks 1,006,711 in total internet traffic. Hope you enjoyed the glimpse into the site. Who knows what the next year will hold?